Golf Australia has announced this week that the 2019 Vic Open will be co-sanctioned by the LPGA Tour. The men’s tournament will be jointly sanctioned by the European Tour and ISPS Handa PGA Tour of Australasia and now on the women’s side by the LPGA and ALPG. 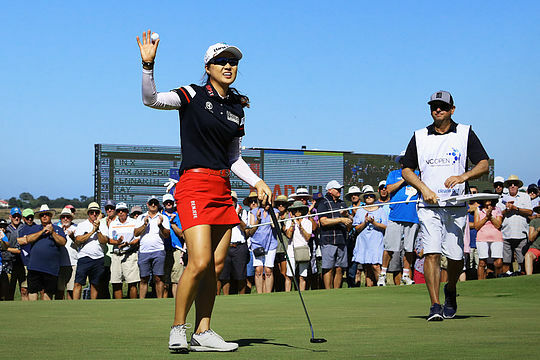 The 2019 Vic Open will be held again at 13th Beach Golf Links and, along with the ISPS Handa Women’s Australian Open, will form part of a two-week Australian swing for the women’s game. In 2012 the event was first played concurrently as a men’s and women’s tournament and gained widespread attention for its unique format at the time. Since then the Vic Open has grown significantly following its move from Spring Valley to 13th Beach Golf Links on Victoria’s Bellarine Peninsula in 2013. Prizemoney at the time was just $300,000 and has since reached a combined $3 million for the 2019 tournament, which tees off February 7-10. “The LPGA Tour has been a great boon for the national championship and we are absolutely delighted the Vic Open will now be part of its worldwide schedule,” said Golf Australia chief executive Stephen Pitt. “Also very importantly, we acknowledge the incredible work done by Simon Brookhouse and the Golf Victoria board and staff who have made this event a special championship in world golf,” Pitt said. Tasmanian Simon Hawkes won the 2018 Vic Open in a playoff with Harrison Endycott to record his first victory on the ISPS HANDA PGA Tour of Australasia while Western Australia’s LPGA star Minjee Lee won the women’s event by five from talented Queenslander Karis Davidson.